Hey, if you want to master the field of surveying and levelling, then you need to learn more and more about Levelling instruments. Because without instruments you can’t do survey. But, Don’t worry you are going to learn Types of Levelling Instruments in this article. Just read the whole article and give your suggestion in the comment section. 2. Wye or Y level. Levelling instruments are employed for determining the relative heights of different points on the earth’s surface. 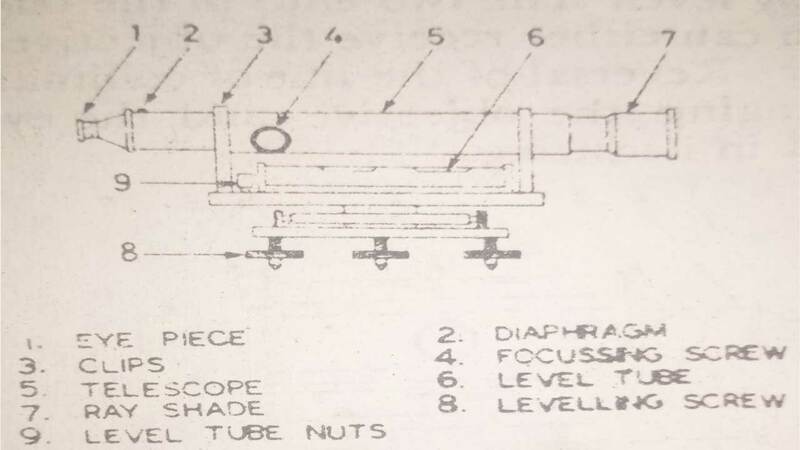 A level essentially consists of a telescope to which a bubble tube is attached such that the axis of the bubble tube and the line of collimation of the telescope are parallel to each other. The instrument is provided with levelling screws by which the bubble tube is centered, and the line of collimation is brought into a horizontal plane. The Leveling head usually consists of two parallel plates the upper plate is supported over the lower plate by three or four-foot screws or leveling screws by which the instrument may be leveled. Most of the modern Levelling instruments are designed to have three-foot screws because they are easily leveled. The telescopes used in surveying instruments consists of metal tubes, one moving axially within the other. There are mainly two types of telescope, (1) the external focusing telescope, and (2) the internal focusing telescope. Most of the modern levelling instruments are designed with internal focusing telescope. The level tube is used for the temporary adjustment of the instrument. Without the correct adjustment, the whole survey may be effected. In the modern form of Dumpy level also called “solid Dumpy level”, the vertical spindle and the telescope are rigidly fixed so that the telescope can neither be rotated about its longitudinal axis nor removed from the supports. This levelling instrument is more stable when compared to others and retains its permanent adjustment for a long time. In this instrument, the stage carries two “wye” supports in which the telescope is fixed. The telescope can be rotated about its longitudinal axis, or it can be taken out and placed end-for-end in the wyes. A clamp and a tangent screw are provided to facilitate accurate sighting of the objects. This is a very delicate instrument and consists of a large number of loose and open parts. Due to the reversibility of the telescope, the instrument may be more easily tested for permanent adjustments. Comparing the Dumpy and the Wye levels, the Dumpy level is better suited for field work than the Wye level as the Wye level is not as compact as a Dumpy level. The Dumpy level is more reliable due to its solid and rigid construction. The advantages of a Wye level are that the same may be tested for the permanent adjustment rapidly and the adjustment can be made indoors. Read More: Plane Table Surveying | Its Methods, Advantages & Disadvantages, etc. This Levelling instrument combines the good features of both the Dumpy and the Wye levels. By loosening the screw, the telescope can be rotated about its longitudinal axis and can also be withdrawn from the sockets and placed end-for-end. 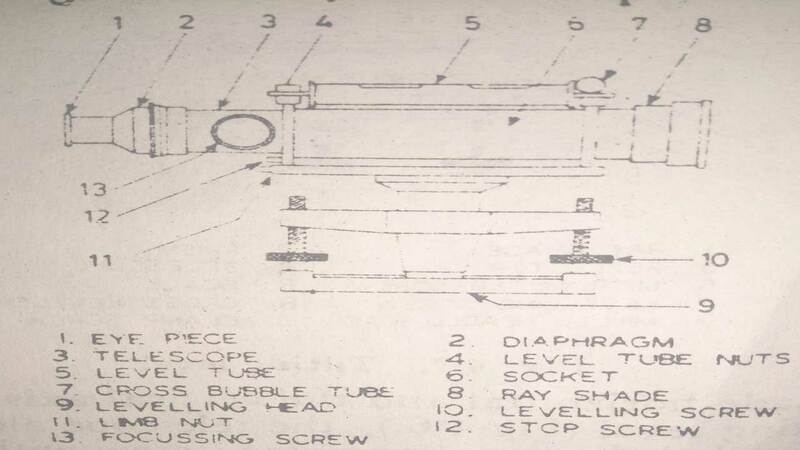 Cushing’s level is in that type of levelling instruments in which, the telescope is rigidly fixed in the collar as in a Dumpy Level. The two ends of the telescope barrel have equal sockets which can either received the objective or the eye-piece and diaphragm. Reversal of the line of collimation may be established by interchanging the objective and the eyepiece. The eye-piece can be rotated in its fitting. In the above four types of levelling instruments, the line of collimation is at the right angle to the vertical axis, if the instrument is in the permanent adjustment. Therefore, when the bubble is centered the line of collimation is made horizontal and the vertical axis is made truly vertical. 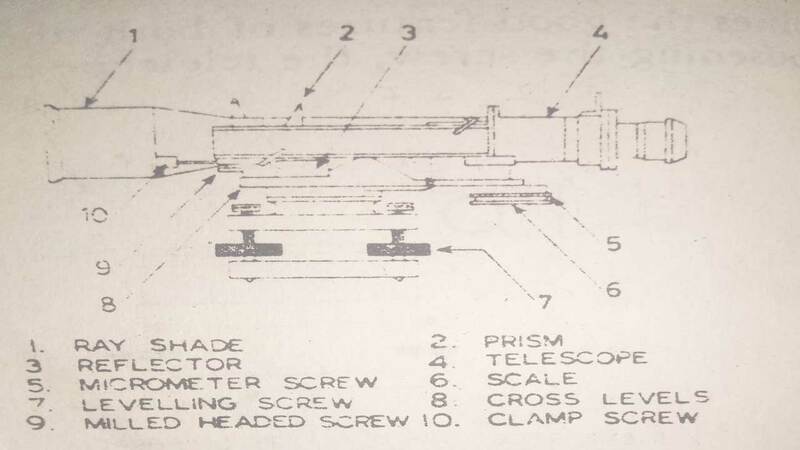 In the tilting level, the telescope along with its bubble tube can be leveled by a micrometer screw without using the foot screws of the instrument, i.e., the line of collimation may be made horizontal independent of the vertical axis. Read More: Tacheometric surveying : Procedure, Method, Advantages. Therefore, the line of collimation may not be at right angles to the vertical axis. Originally, the tilting levels were designed for preliminary works only, but now they have become very popular and are being used for ordinary levelling also. 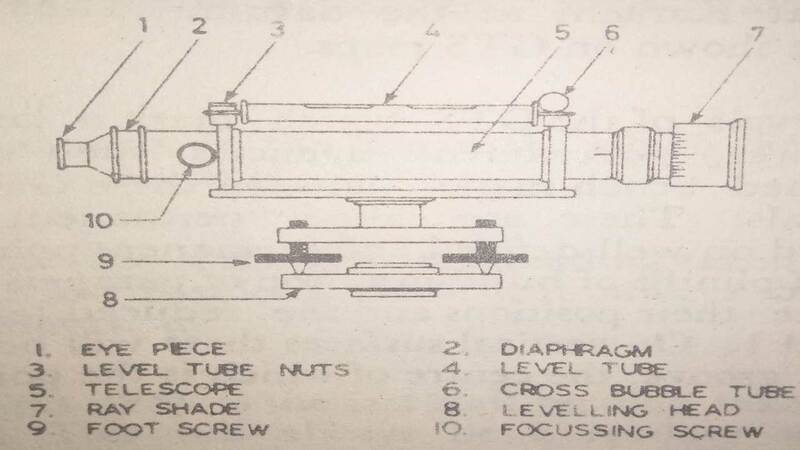 As the micrometer screw tilts the telescope in a vertical plane, the level is called a tilting level. When a tilting level is used for levelling work, the vertical axis is only approximately set vertical by levelling screws. (Unlike the other types of levelling instruments in which, the bubble should be exactly centered by foot screws). …and before taking each Staff reading the main level tube is exactly centered by means of the micrometer screw. 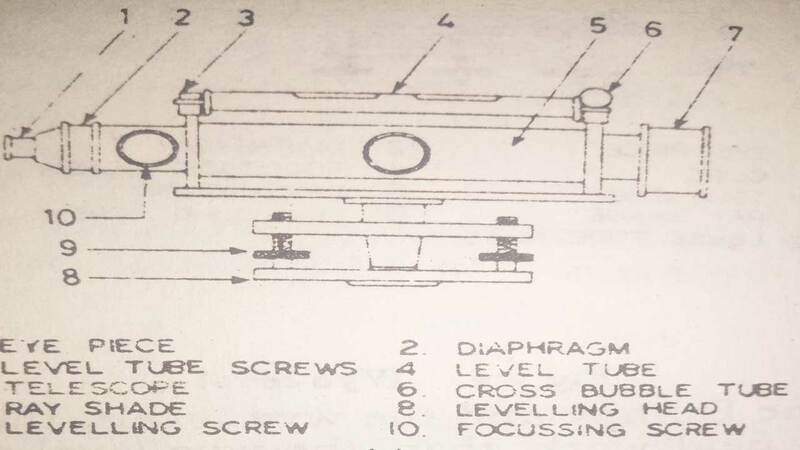 The advantage of tilting level over other types of levelling instruments is that as the instrument is to be only approximately levelled by using the foot screws, much time is saved, which would be otherwise lost in bringing the bubble exactly to the center of its tube by using the foot screws. Another advantage is that the grades or lines with a particular gradient can be laid by means of the micrometer screw. Don’t forget to share this article. Thanks! I have a Hilgar watts level circa 1970. It can slide and internally there is a prism which is illuminated through a small aperture above. Can you give me any explanation?